AUTEUR ARIEL: When in doubt, dance it out. I've always been skeptical about headpieces because I didn't think they would look good on me. However, they always look amazing on other people so I decided to give it a try, I gotta say, I'm loving it! I paired it off with this flowy white blouse from Pink Blush to create a fun, but still casual boho look. 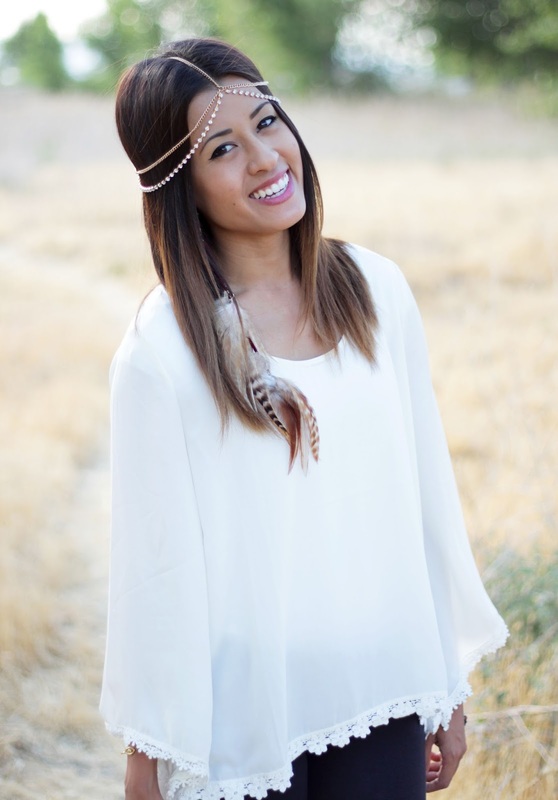 I'm bummed that music festival season is over because this headpiece would be the perfect accessory for it! I'll just have to find a concert or carnival to wear it to so I can show it off! I couldn't help but dance a little bit I was taking pictures for this outfit--this top is too flowy not to twirl in! I'm not the greatest dancer and I only have like 3 signature dance moves (Connor calls one of them The Octopus Dance), but that doesn't mean that I don't like to bust a move every so often (both in private and in public). I'm a firm believer in dancing it out when you're in doubt. Sometimes there's nothing like a spontaneous dance party that'll clear your mind and relax you up a bit! I was looking at old videos of my friends and I when we were single and crazy (okay we are still pretty crazy) and I came across this dance video we made. Pretty sure it was around Finals Week when we made this video, hence the obnoxious amount of dancing and procrastinating. I can't believe this was almost 4 years ago! Time flies by so fast. Anyway, enjoy the dorky 18-year-old version of me makin' a fool of herself. This has to be one of my favorite looks of yours!! That headband is gorgeous!! bahahhaa your video!!!! too good. hahaha gotta love videos of our freshman in college selves LOL love the headpiece! Great look! Your headpiece is adorable! I LOVE the headpiece! I've been debating getting one for a while and now I think I definitely need to get one! Love your blog! I love the lace details on the top! Thanks for linking up last week!